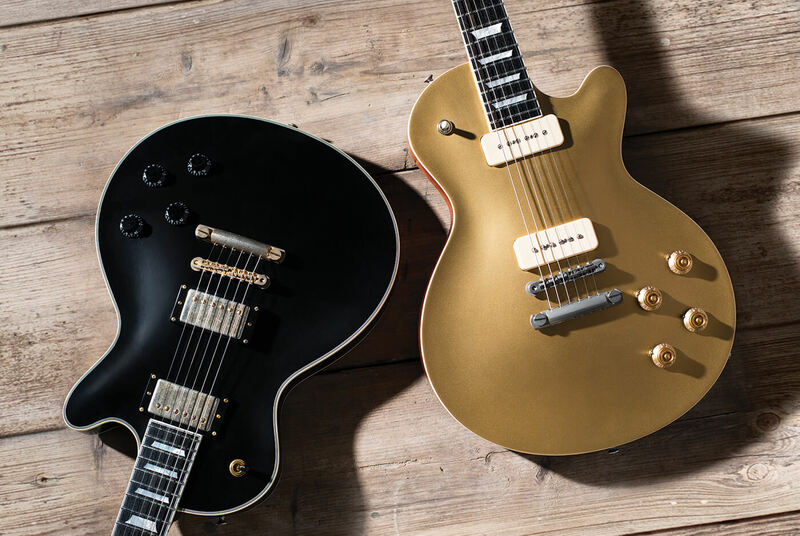 Eastman’s vintage-style single-cut range was expanded this year to include Goldtop- and Black Beauty-inspired models. This isn’t the first time we’ve featured Eastman’s take on the single-cut solidbody theme, and these two models are similarly 50s-inspired. Crafted in China in a factory with a long history of instrument building, the specifications of these guitars greatly exceed expectations at this price point. Both instruments ship with hard shell cases and feature one-piece mahogany necks and bodies, with carved maple caps and bound ebony fingerboards. The latter neatly circumvents any CITES headaches with regard to rosewood but as we have come to expect from Eastman, it’s top quality. The ’boards themselves have immaculate pearl inlays and the Jescar medium-jumbo fretwire (installed sans binding nibs) is highly regarded. Most of the Eastman models that we’ve seen so far have had French-polished Antique Varnish finishes derived from the violin-making side of the business, but the company also uses nitrocellulose. The ‘Vintage Nitro’ here isn’t relic’d as such, but the finish hasn’t been cut and polished in the usual way and the satin feel recalls Fender’s earliest Highway One models. The hardware is high quality, with Gotoh bridges, aluminium tailpieces and vintage-style tuners, and it’s all tastefully aged. Inside the control cavity we see CTS potentiometers and 0.047uF Sprague Orange Drop tone capacitors. The wiring is expertly done, while the pots are actually 500K rather than the 250K specified on Eastman’s website. 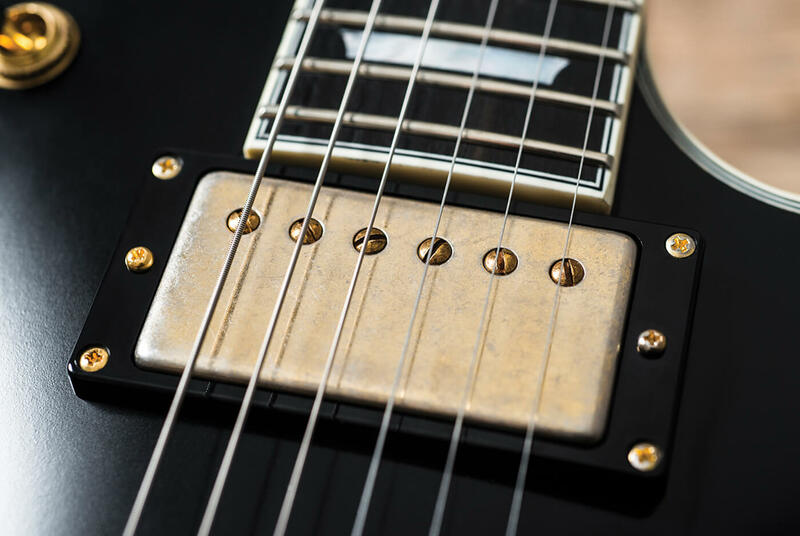 The SB56’s distinguishing features include Lollar Custom Aged Soapbar P-90 pickups with an underwound neck unit, single-ply body and ’board binding and nickel-plated hardware. We like the 50s-style mounting for the pickup selector with no ‘poker chip’. The dulled-down black finish and expertly aged gold hardware really suit the SB57 and the slightly tinted lacquer over the multi-ply body, neck and headstock binding is a nice touch. This time we have a set of Lollar Custom Aged/Wound Imperial Humbuckers and the stylised pearl diamond inlay on the headstock looks a treat. We’ll get into the electronics side of things later on, but before we do, it’s worth discussing the subtle differences between the unplugged tones on offer here. Both guitars are certainly lively ones, with vibrations that transmit through the body and into your chest. The acoustic sustain promises great things and these are naturally loud guitars. However, the SB56’s chiming sprang is in definite contrast to the SB57’s smoother and slightly warmer tone. The SB57 also has a touch more of the woody midrange resonance that we’d normally associate with vintage Les Pauls and the best modern guitars of their ilk. Either way it’s an encouraging start for both models, but if pushed we’d say that we slightly prefer the black guitar’s unplugged tone. As you might expect, the weights and general playing feel of both instruments are more or less identical, too, and this is one area where Eastman steals a march on some of the competition. As LP-style guitars go, these are relatively light despite having solid, one-piece mahogany bodies. This is an indication that the Eastman factory is sourcing its wood with great care, and we’ve mentioned in previous issues that the high volume of violins it produces gives the company considerable buying power when it comes to timber. Better still, the neck profile on both guitars feels excellent. It’s full without being bulky and there’s no discernible shoulder. Viewed square on from behind these necks ace our ‘can you still see the binding?’ test, and if this is an attempt to replicate a late-50s Gibson feel, it’s a job well done. Our only gripe is the abrupt and truncated heel carve, which acts more like a buffer than something that will ease into your palm as you attempt to wail away on the upper frets. Kicking off with the SB56, the Lollar P-90s sound like a modern twist on the 50s formula. The bridge produces a thrilling ‘brrrang’ through a cranked valve amp and the underwound neck unit contributes a smoother and mellower tone. We always look for contrast with 50s inspired single-cuts and the Lollars certainly deliver. Pick attack is precise and the lows are well defined, but like a lot of high-end, modern P-90-style pickups, these are somehow brighter but less clear sounding than vintage examples and the very finest replicas. The review guitar doesn’t have foam or springs beneath the pickups so it’s not possible to adjust their heights relative to the strings without taking everything apart, but we think the tone and balance would benefit from lowering the bridge unit and raising the neck. Even so, there’s a huge range of classic tones on offer, not least because volume control clean-up works really well and is very much in line with our experience of vintage Gibsons. If the tone control wiring was altered to 50s-style layout, we think things could be even better. 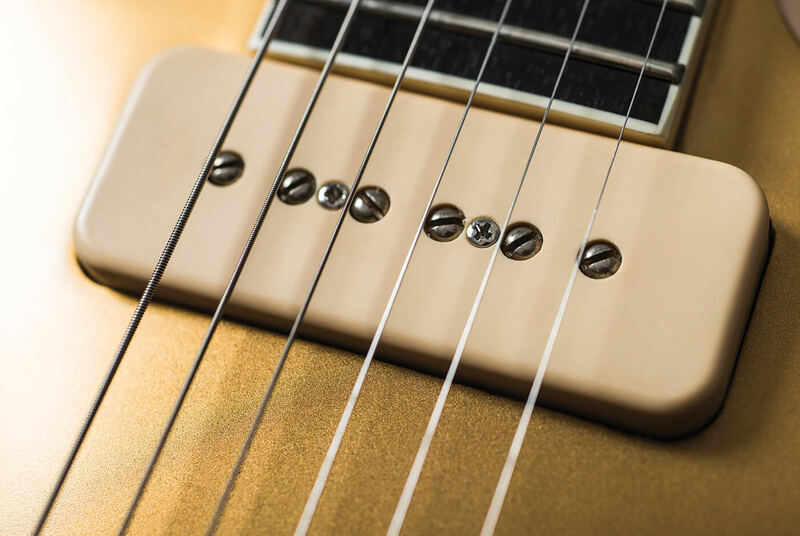 Whether it’s attributable to the SB57’s acoustic character or the humbuckers is hard to say, but while the SB56 gives a tantalising taste of vintage tone, the 57 really lays it on thick and creamy. It may not be quite as raucous as the 56 but it’s just as powerful and much more sophisticated. The bridge pickup has brightness and just enough midrange quack. The neck is both smoother and sweeter with a pleasing hint of treble sparkle, and in the middle setting you can notch back the neck volume to emphasise the phasiness. But the real magic must be a combination of all the factors because it has an uncanny ability to sustain notes and it manages a bit of harmonic bloom, too. It’s an expressive and dynamic instrument for soloing that really sings, but also delivers huge and crunchy power chords. We find it equally adept at the clean stuff as the neck setting produces a fine jazz tone and the bridge takes on a surprisingly countrified flavour. There’s little doubt that these guitars would sound even more old-school if the pickups weren’t wax-potted, but the tones are excellent nonetheless. That said, the tone controls aren’t the most responsive, they don’t really kick in until they’re backed off to around two, and at zero all definition is lost. However, we’re assured that the review guitars are prototypes and that the production models will have improved tone pots with better tapers. In all other respects, these guitars give you vintage-inspired playability and tone with all the desirable features at a relatively affordable price.